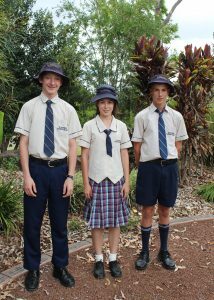 The College formal and sports uniform is to be worn with pride by students of St Stephen’s Catholic College. The uniform has been chosen by the college community to be practical and attractive in order to enhance the dignity of each individual. 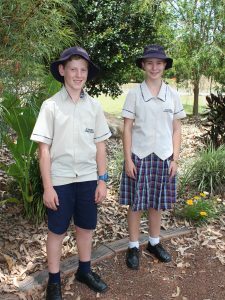 This uniform is a sign that a student is a member of the St Stephen’s community and the appropriate wearing of our uniform demonstrates pride in our college, respect for self and respect for others. All aspects of uniform (except shoes) are to be purchased from retail stores holding our uniform. Sports Uniform: The school sports uniform for both boys and girls is purchased through the retail store holding our uniform. The sports uniform contains the college crest and colouring and is also embedded with the respective house colours. Students are required to wear the school sports socks purchased through retail stores holding our uniform and any low cut sports jogger. School Bag: Students are expected to have the St Stephen’s school bag, purchased through the retail store holding our uniform. Hair: Students are expected to have a natural single colour or shade. Hairstyles are to be compatible with the uniform and not of a radical style. Hair is to be kept neat and tidy. Girls with hair longer than shoulder length should have their hair tied back using white, beige or navy blue hair restraints. Long hair is to be restrained and not to fall across the face. Boys’ hair must be above the collar, tidy and worn off the face; hair ties/restraints are not permitted. Undercuts are not to be visible. Students are not permitted to have shorter than a ‘number 2’ clip. Boys must be clean-shaven. Jewellery: Girls may wear up to two plain sleepers, silver or gold, or studs less than 5 mm in diameter (may contain a small birthstone in each ear). Boys may wear one small sleeper or stud. A plain fine metal neck chain with a Christian religious medal or crucifix attached; a watch (smart watches prohibited) and a medic alert are allowable. Other visible body jewellery, including piercings covered by band aids, is not acceptable. No visible tattoos are permitted. Hat Policy: Students are expected to wear the navy blue hat to and from school each day. The hat must be worn during morning tea and lunch breaks. Make-up, fake nails and nail polish are not permitted. In extenuating circumstances, any alteration to the standard school uniform must be accompanied with a written explanation from a parent/guardian that should be provided to the home form teacher. Continuous infringements will incur consequences. No aerosol cans. Hygiene: roll-on deodorants.